FILE - Supreme Court nominee Brett Kavanaugh testifies during his confirmation hearing before the Senate Judiciary Committee on Capitol Hill in Washington, Sept. 6, 2018. Kavanaugh's statement comes after Senator Dianne Feinstein, the top Democrat on the Senate Judiciary Committee, said she has notified federal investigators about information she received about the nominee but won't disclose publicly. FILE - Senate Judiciary Committee ranking member Sen. Dianne Feinstein, D-California, arrives for a hearing of the committee, on Capitol Hill in Washington, Dec. 6, 2017. A spokeswoman for Representative Anna Eshoo, a California Democrat, declined to confirm reports that the congresswoman had forwarded a letter containing the allegations to Feinstein. She said her office has a confidentiality policy regarding casework for constituents. She said Kavanaugh has had 65 meetings with senators — including with Feinstein — sat through over 30 hours of testimony and publicly addressed more than 2,000 questions. 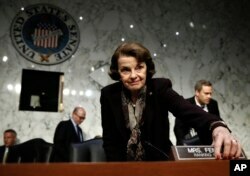 "Not until the eve of his confirmation has Senator Feinstein or anyone raised the specter of new 'information' about him," she said. Senator John Cornyn of Texas, the second-ranking Republican and a member of the committee, was also skeptical. Chairman Chuck Grassley, a Republican from Iowa, was unaware of the information until it was made public, according to a GOP committee aide. Kavanaugh has undergone six federal background checks over time in government, including one most recently for the nomination, the aide said.